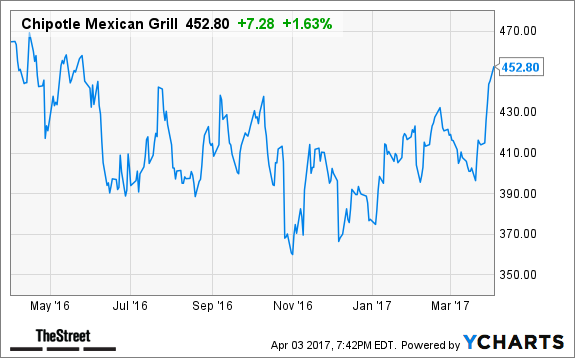 Jim Cramer says Chipotle's recovery is in its infancy, but all the pieces are there. Chipotle just needs to put them in place. Chipotle (CMG - Get Report) has struggled for quite some time following an E. coli breakout in fall 2015. The stock cascaded from the low-$700s to the mid-$300s, as investors dumped its stock. For months, Cramer has reiterated that Chipotle would get its groove back, but it generally takes about 18 months for the recovery. Previous outbreaks at chains like Taco Bell and Jack in the Box (JACK - Get Report) tell a similar story. Shares are up almost 10% over the past five trading days and 20% so far in 2017. During its previous conference call, we found out the company's same-store sales growth is trending higher, climbing 24% in January, above December's 14.7% increase. While those numbers are lapping easy comparable sales, they are trending in the right direction. Increasing same-store sales are usually an early indicator that things are working, even if earnings don't rebound quite as fast. And that's really the concern. Investors are starting to buy into the rebounding sales thesis, but earnings will be a different story. With rising spending on advertising, labor, digital initiatives and food costs, it's unclear if Chipotle will hit its goal for $10 in EPS this year. Still, it's important that customers are getting back in the door and it appears that they are, Cramer said. While Chipotle may not regain its super premium valuation from its pre-breakout days, it doesn't have to for the stock to rally further. Here's the bottom line: Investors who are long Chipotle should stay long the stock. Investors looking to buy should wait for a pause and grab the stock on a pullback. When Chipotle really takes off, it will be hard to catch, Cramer said. The recovery is in its infancy, but all the pieces are there. Chipotle just needs to put them in place. Over on on Real Money, Cramer says this pullback is exactly what the markets need to shake out the weak hands and get better owners in for the long haul. Check out his analysis with a free trial subscription to Real Money. Cramer and the AAP team say they are currently restricted on Southwest (LUV - Get Report) , but if they could, they would be adding to their position today on the broader market selloff. Read what they're telling their investment club members. Get a free trial subscription to Action Alerts PLUS.